Move over Scotty, Captain Kirk has a new favorite engineer. Actor William Shatner, the Canadian actor who portrayed the iconic captain of the Starship Enterprise on TV's "Star Trek" hailed Canada's soon-to-be first space station commander on Twitter to find out the latest news from orbit. Shatner wrote to Canadian Space Agency astronaut Chris Hadfield, who posts Twitter updates as @Cmdr_Hadfield, Thursday (Jan. 3) using his own Twitter handle @WilliamShatner. "@Cmdr_Hadfield Are you tweeting from space? MBB," Shatner wrote, signing off with his abbreviation of "My Best, Bill." It did not take long for Hadfield, a mechanical engineer and retired colonel in the Canadian Armed Forces, to beam a reply down from the International Space Station. "@WilliamShatner Yes, Standard Orbit, Captain. And we're detecting signs of life on the surface," the astronaut wrote. Hadfield launched into orbit in December aboard a Russian rocket to kick off a months-long mission to the International Space Station. He currently serves as a flight engineer on the space station's six-man Expedition 34 crew. In March, he will take charge of the station's Expedition 35 mission increment, making him Canada's first space commander. Officials with the Canadian Space Agency (on Twitter as @csa_asc) also used the social media website to confirm to Shatner that Hadfield was, in fact, using Twitter to post updates and photos from space. "I'm very impressed!" Shatner wrote back. Canadian astronaut Chris Hadfield strums a guitar while playing Christmas carols and gazing at Earth from the International Space Station in December 2012. Shatner and Hadfield actually have met before, at least in photo form. 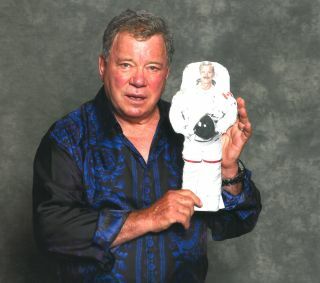 The actor posed with a tiny paper version of the astronaut as part of a public outreach campaign for Hadfield's mission. "The last time @WilliamShatner and I met was in another dimension - 2D," Hadfield wrote as he posted the photo. CSA officials even invited Shatner for a visit, offering him a chance to speak with Hadfield from space. The agency's headquarters, the John H. Chapman Space Center, is located in Saint-Hubert, Quebec. "I can't make any promises but I will see what I can do. MBB," Shatner wrote. Astronauts on the International Space Station have used Twitter as a way to post mission updates and photos from space since 2009, when NASA astronaut Mike Massimino became the first spaceflyer to use Twitter from space during the last space shuttle mission to the Hubble Space Telescope. As of today, Hadfield has 61,432 followers on his Twitter account, which he used to unveil the first original song recorded in space (his tune "Jewel in the Night") last week. Hadfield is due to return to Earth in mid-May. You can follow Chris Hadfield on Twitter here, @Cmdr_Hadfield, and Shatner here, @WilliamShatner.